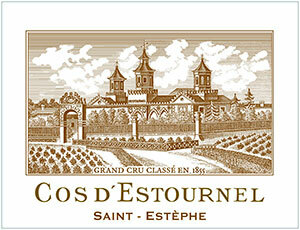 The 2007 Cos d'Estournel is blended of 85% Cabernet Sauvignon, 12% Merlot and 3% Cabernet Franc. It has a deep garnet-brick color and the nose reveals quite a lot of evolution—more than the previous six vintages tasted before it in this tasting—with notes of prunes, figs, chargrill and dried herbs plus hints of raisin cake, leather, balsamic and incense. Medium-bodied, refreshing and mature in the mouth, it delivers a good concentration of savory/spicy flavors and an herbal lift on the finish. It should remain at this evolutionary plateau for the next decade, before it begins to decline. Tasted at BI Wine & Spirits' 10-Years-On tasting, the 2007 Cos d'Estournel has plenty of ripe red cherry, cranberry and wild strawberry scents on the nose, hints of marmalade and cooked meat developing in the glass. The palate is medium-bodied with cherry liqueur and licorice on the entry; there is good depth and substance here, although the exotic finish does not chime with the vintage and feels out of place. Personally, I would pick the superb 2008 Cos d'Estournel over this. Tasted February 2017.